Your choice for the most disappointing NFL team of 2018 probably depends largely on your rooting interests and isn’t a scientific question to begin with, but the shortlist of candidates definitely includes the Cheeseheads. The Packers were widely expected to contend in 2018 with a full, healthy season from Aaron Rodgers, but got 16 games from the superstar and still managed only a 6-9-1 record, including an awful 1-7 mark away from Lambeau Field. It was Rodgers’ worst healthy fantasy season as a starter and led to the first coaching change in Green Bay since before the 2006 season. Things weren’t all bad, though. Davante Adams firmly put himself in the top tier of fantasy wide receivers; he might have led all receivers in fantasy scoring if he had played Week 17. After some fits and starts, the Packers quasi-turned to Aaron Jones at running back in the middle of the season and he responded well; from Week 8 to Week 14 he had double-digit carries in every game and was the PPR RB7, only for his season to end in Week 15 because of injury. So things are miles from hopeless in Green Bay, but there is work to be done before the team reclaims its spot as a true contender. Let’s look at the fantasy moves we’d like to see. Randall Cobb and Geronimo Allison are both entering free agency after down years, and while it will be weird to see Cobb playing anywhere but Green Bay, the team probably wants more upside out of the role. With the Jimmy Graham signing turning into a disappointment as well, the Packers need another receiving weapon, and Tate would fit that role perfectly. He’s an aging option, turning 31 before the next season starts, but with Rodgers also coming down the back half, it makes sense for the Packers to catch the last upside for some guys rather than investing heavily in futures that Rodgers might not be around for. Tate’s been a stud. Over the last five years, only 10 receivers have more PPR points, and he’s only played two games shy of the maximum since 2011 — with one of those absences coming because the timing of last year’s trade gave him two bye weeks. Pairing Tate with Adams would give the Packers one of the league’s top 1-2 punches at wide receiver … again. 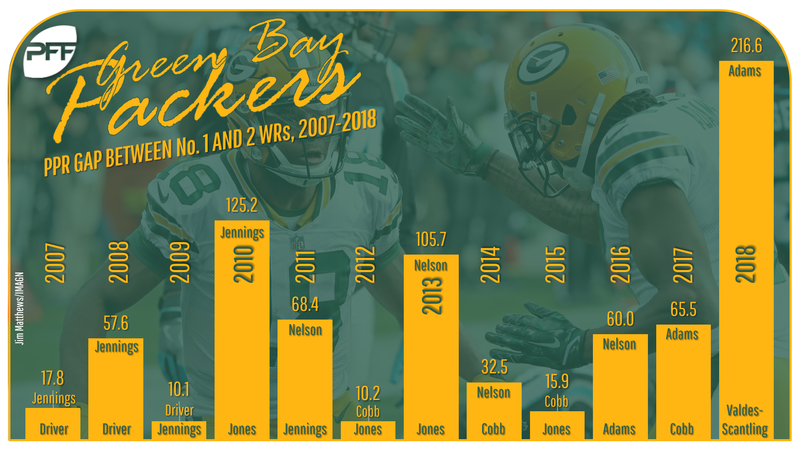 Tight end has been a revolving door for Green Bay since the premature end of Jermichael Finley’s career, with Jared Cook, Martellus Bennett, and Graham each spending a year with the team in recent years and each disappointing in the process. Current rumors are Graham will be back for 2019. But if he is or he isn’t, instead of signing another retread like Austin Seferian-Jenkins or Jesse James, better at this point to go back to the drawing board and draft a tight end from this year’s TE-heavy draft pool. Steve Palazzolo’s latest PFF mock draft has the Packers taking Texas A&M’s Jace Sternberger with their second first-rounder, but whether it’s Sternberger or some other tight end, they shouldn’t come out of this year’s draft without someone who can play the position. Maybe it’s Rodger Saffold, or maybe it’s one of the less obvious names, but the Green Bay offensive line wasn’t at its peak in 2018 and could use some run-blocking help for Jones and Jamaal Williams. Guard is the obvious point of improvement.